Congratulations, you’re expecting! Between buying staples for the baby, to redecorating and everything in between, it might seem daunting to think about completely overhauling your closet too! But, we’ve got tips on the maternity wardrobe essentials that you actually need as your body grows and changes. Making sure you have the right essentials for your maternity wardrobe can seem daunting, but we’re here to help. Watch the video to see all of our maternity essentials! Dresses are the easiest way to look polished in a snap. If you’re in need of workwear, try a shift dress to boast that bump. Classic tailored dresses with ruching are a great option that can grow with you from conception to congrats. Add some on-trend statement jewelry to a basic LBD and you’re ready to slay all day. Wrap dress are a universal figure-flattering option that you can rock throughout your pregnancy, and make for great nursing-friendly options (if needed) after bae arrives. If you can’t find a maternity specific wrap dress you love, consider simply sizing up a traditional wrap dress for extra baby room. Maxi dresses are comfortable, flattering and functional. Marry a solid staple maxi dress to on-trend accessories for styling versatility. 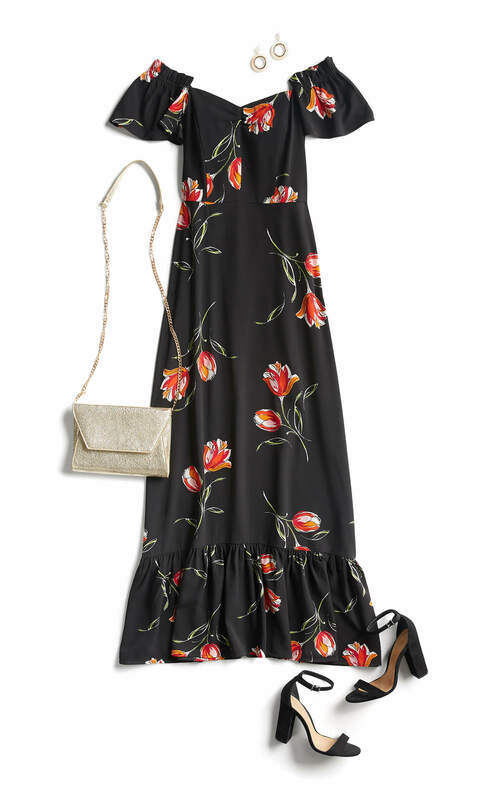 For date night or a special event, consider adding a printed kimono and statement earrings for flare. If you only want to spring for one piece of clothing during your pregnancy, make it a pair of maternity jeans. Yes, they will probably come with a belly band, but trust us—you’ll be so much more comfortable. On-trend maternity denim is easily accessible, so stock up on a few trusted fits you already love that can rotate and repeat. As a general rule, a pair of skinnies, cuffed boyfriend jeans and cropped flares or capris are good to have in your with-child wardrobe. If the weather is warm, make sure you have at least one pair of maternity shorts to help keep you glowing without roasting. Tops that can stretch with your bump throughout your pregnancy are a must, so make sure you are adding tops with stretch. A classic knit tee will stretch with you as your bump grows and is always a comfortable and easy option to reach for. As your bump starts to make its way into the last trimester, spring for a couple of tops with ruching on the side to accommodate your baby in tow. Which maternity essentials do you need to add to your closet before you reach full term? Schedule a Fix and let your Stylist know!